Zest lime and juice it. Boil water with sugar, add raspberries and let simmer for approx. 10 – 12 min. on low heat. Next, puree everything with the hand blender. Now strain the mixture through a strainer into a large bowl. 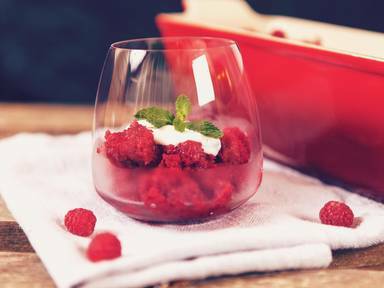 Add white wine, raspberry brandy, lime juice, and lime zest and mix well with a whisk. Pour the liquid into a baking dish approx. 25cm x 35cm and put into the freezer. After approx. 2 – 3 hours, when the edges are partly frozen, stir the mixture once with a fork. Then, leave in the freezer for at least an additional 2 – 3 hours to solidify. For the mint yogurt, mix natural yogurt with confectioner's sugar and the lime juice. Cut the mint leaves into thin strips and fold into the yogurt.